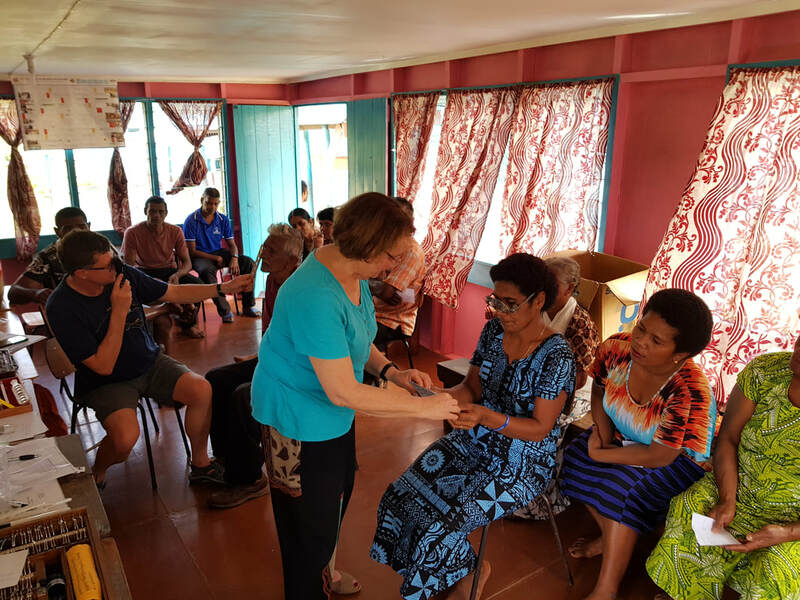 Auckland Eye specialist Dr David Pendergrast has recently returned from a voluntary trip helping with the Taveuni Eye Project in Fiji. This is an annual Eye Surgery Programme providing removal of Cataracts and Pterygia for Fijians in remote villages and islands who could otherwise not afford the travel and accommodation costs. The Rotary Club of Taveuni (RCTI) organises the transport from their village, which is often incredibly long and arduous. From the most remote villages it may mean travelling on a bus to the ferry, then a ferry trip of up to 12 hours, and finally a Rotary van from the wharf on Taveuni up to the local accommodation provided in the hospital or church or school. The patients all sleep on mattresses in the hospital and on the post op day the patients with eye patches on are sitting in rows on chairs watched by others who have either already had their surgery or are awaiting surgery the next day. The local Rotary team also provides food for the patients including hundreds of kilos of taro, sacks of rice, and lots of sugar for their tea. The Taveuni Project has been going for 11 years now and the team includes a great mix of locals and New Zealanders. Ineke Van Laar from Tauranga has been the very efficient organiser for the nursing and theatre side, and the transport, logistics and food is organised by Michael Prasad who is a tireless and enthusiastic local businessman. He sits at the hub of the clinic area and makes sure we all have enough to do. We have learned to never believe Michael when he says “only another 4 more cases and we are finished for the day". Somehow he always manages to fill the day up to the brim. The leader of the surgical team is Dr Jeff Rutgard, an American surgeon from San Diego, who has been operating in Taveuni since the project started. He will often bring a junior surgeon (either a fellow or new consultant level). In addition, many instrument and surgical supply companies have also assisted, this year we had the benefit of two beautiful operating microscopes supplied by Zeiss, one at minimal cost, one donated. They were very much appreciated. Anyone who has gone on a trip like this , which is generally organised through the Volunteer Ophthalmic Services Overseas (VOSO), will understand the satisfaction of helping people who are often severely visually impaired, and otherwise would not have access to treatment. The faces of the patients on the post op day, their thanks and the beautiful singing that always seems to follow, especially on the final day, makes all the hard work more than worthwhile. However, there is always the frustration of those difficult cases as well, which show the limitations of treatment options and ongoing access to medication in Fiji. There are no vitreo-retinal services in Taveuni and even simple things like intra ocular inflammation or glaucoma may not get adequate or indeed any treatment once the team leaves. Dr Jeff however, was impressed that in New Zealand there is such a strong tradition of voluntary surgery, with significant numbers of surgeons regularly participating in VOSO or similar trips as well as those who work with Pacific Eye Institute or other organisations. Jeff said only a handful of US surgeons are interested in voluntary surgery. 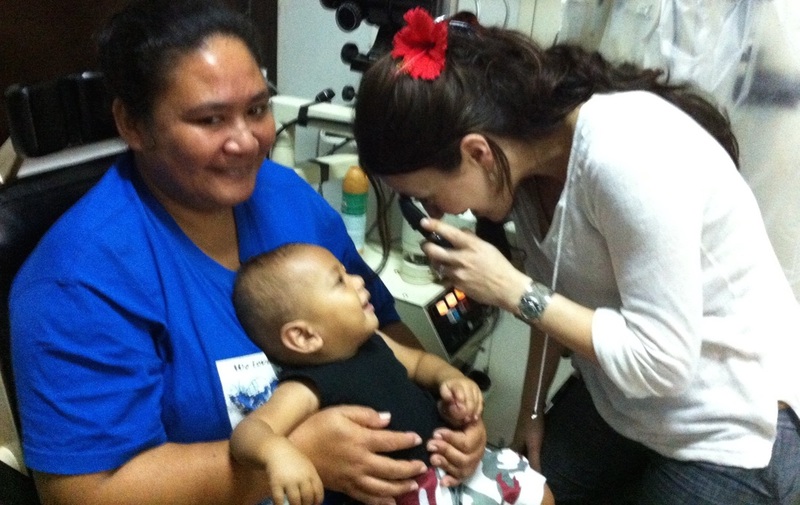 The team at Auckland Eye is committed to providing ophthalmic support to our neighbouring developing countries. To read more about the volunteer work our doctors undertake take a look at our Philanthropy page. Aside from the television advertisements showcasing tranquil island getaways, I knew very little about Samoa when I decided to take the opportunity to accompany John Tarbutt on VOSO’s annual optometric outreach to Samoa in August this year. We were also able to identify many cases of pathology which were referred for ophthalmic care when the next surgical team arrived on the island. With the lack of adequate eye care, many simple pathological cases, such as cataract, pterygia and diabetic retinopathy, were in their most advanced states; to a level which we would never see in NZ. While acutely aware of how much more I would be able to offer these patients if they were in my home practice in the Waikato, their gratitude for our services provided the driving force to make this appeal a success. My week in Samoa was an eye-opening experience which enabled me to appreciate the true value of the care we offer as optometrists. 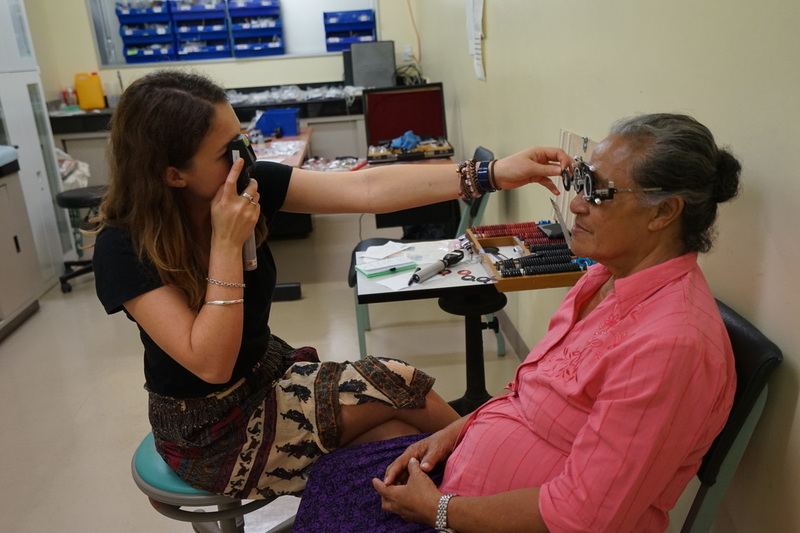 It was a privilege to be able to help the lovely people of Savai’i, and I encourage any interested optometrists to volunteer their time for future outreaches should the opportunity arise. Although Samoa attracts many tourists to its paradise beaches, it remains on the United Nations list of least developed nations. Samoa has strong links with NZ and has been visited by VOSO at least once a year. This was my first opportunity to volunteer with VOSO, and hopefully not my last. Geographically Samoa is comprised of two large volcanic islands, Upolo and Savai’i, and a few smaller islands. 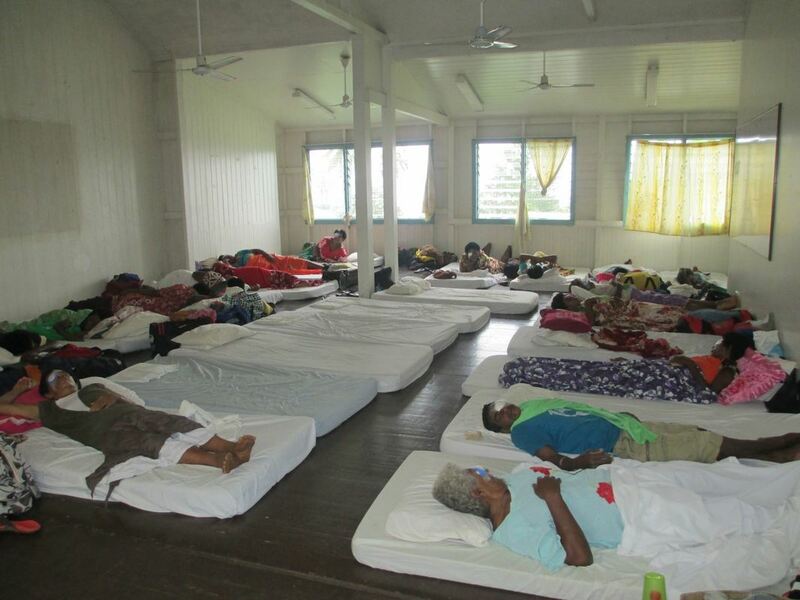 The situation for eye care is poor outside the capital of Apia, especially on Savai’i where there is only one resident GP for a population of 60,000 and no optometrist or ophthalmologist. Over the years the VOSO team led by John Tarbutt has been trying to shift the focus from cursory eye screenings to a more thorough eye examination. For two weeks, John and I were ably assisted by the national hospital optometrist Erna Takazawa, and two local nurses. Most days we had two optometrists refracting while the third was on slit-lamp. The clinics were packed full of pathology. There were injuries aplenty from cricket balls, tree branches, nails and fishing hooks. The pain tolerance of the Samoans was immeasurable! We identified those with advanced cataract, pterygia, and other pathology requiring surgery for the Pacific Eye Institute surgical team who were to follow a week behind us. I was staggered to hear that the Pacific Eye Institute (PEI) team reached a record-breaking outreach with 186 operations in 5 days! I was impressed with the quality of the new and pre-loved spectacles we were able to prescribe. Even more impressed with John who somehow managed to fit a new slit lamp into his luggage! This slit-lamp was generously donated by Optimed to replace the broken one at the hospital. The fluorescein donated by John, was also most welcomed, as there was a fishhook emergency while we were at hospital and the only fluorescein they could find was a strip that expired in 2005. It was certainly a different type of optometry than what we are used to in NZ – one can’t be too idealistic and one needs to be adaptable and prepared to compromise. We achieved most objectives with regard to referrals to the PEI surgical team, diabetic screenings, refractions and spectacle dispensing. 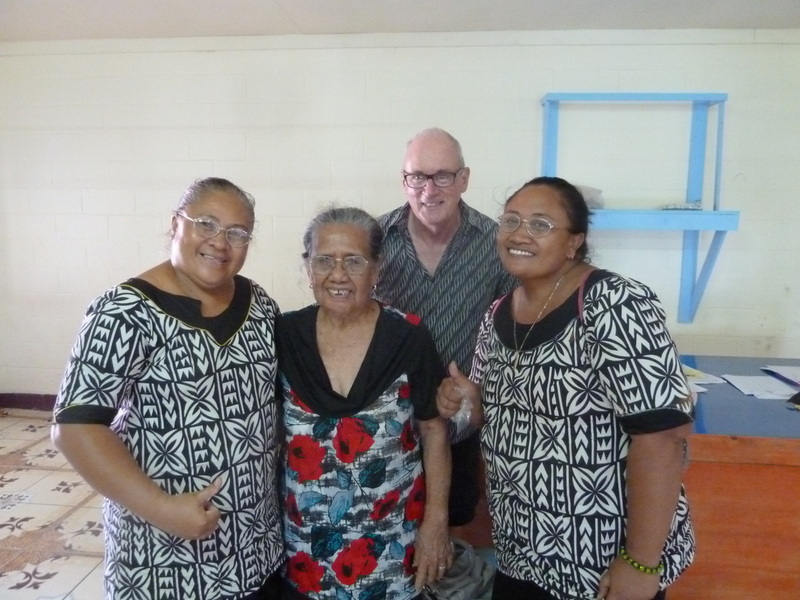 Where possible we provided mentoring to Erna and the eye nurses, including two trainees, importantly maintaining good VOSO and Samoa National Health Services relationships whilst also helping them towards self-sufficiency. I could not have asked for a more prepared, hardworking, and enjoyable team to work with. Volunteering in Samoa was the perfect opportunity to put my newly acquired therapeutic knowledge to use. It allowed me the opportunity to experience a new culture beyond my normal travels. Ultimately though it was great to regain some perspective and to give something back. Faafetai lava (thank you very much).